When you visit a rainforest, especially in January, you should probably expect rain. I could hear the light rain falling even before I was quite awake this morning, lightly tapping on the roof of the lovely Bed and Breakfast where we stayed in the tiny town of Forks (of Twilight fame). Light comes late here, with sunrise around 8am! 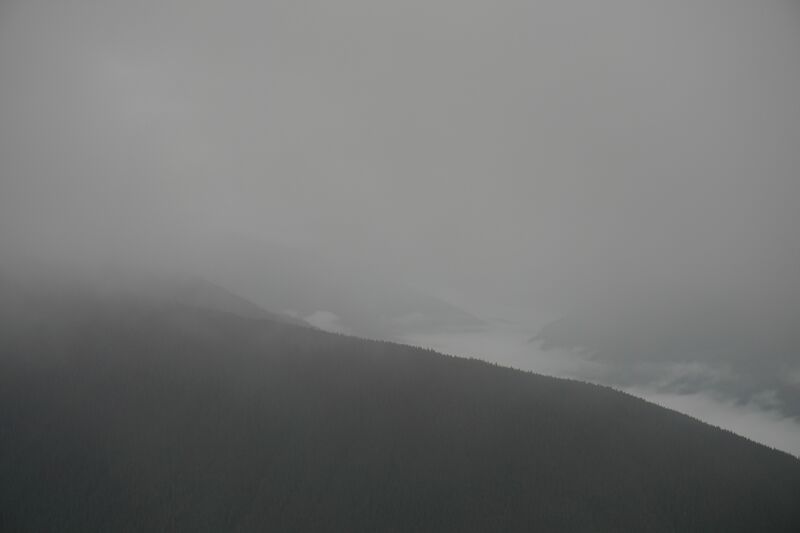 It was gray and wet as we ventured out, heading toward the Hoh rainforest and the Hall of Mosses. But we weren’t the only rainy day adventurers. 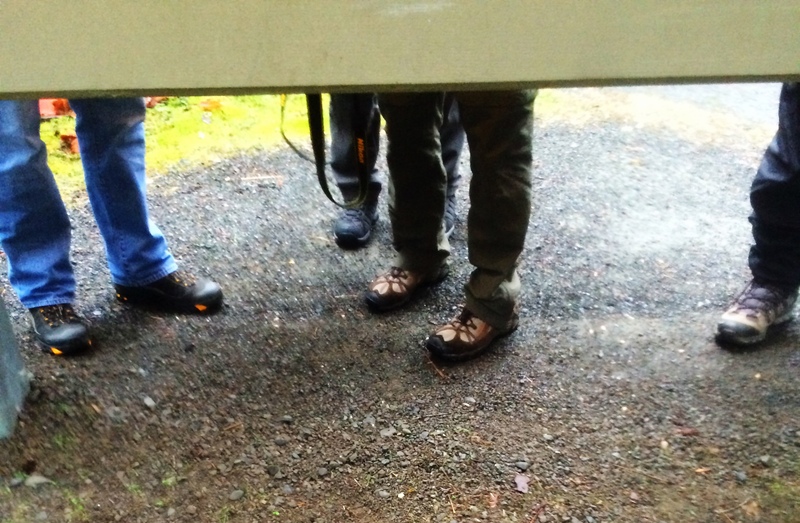 As we registered at the ranger station I couldn’t resist this shot of the hiking boots from the other side of the sign. All this rain results in spectacular displays of mosses. Everything that stands still is covered in velvety coats of shaggy moss. 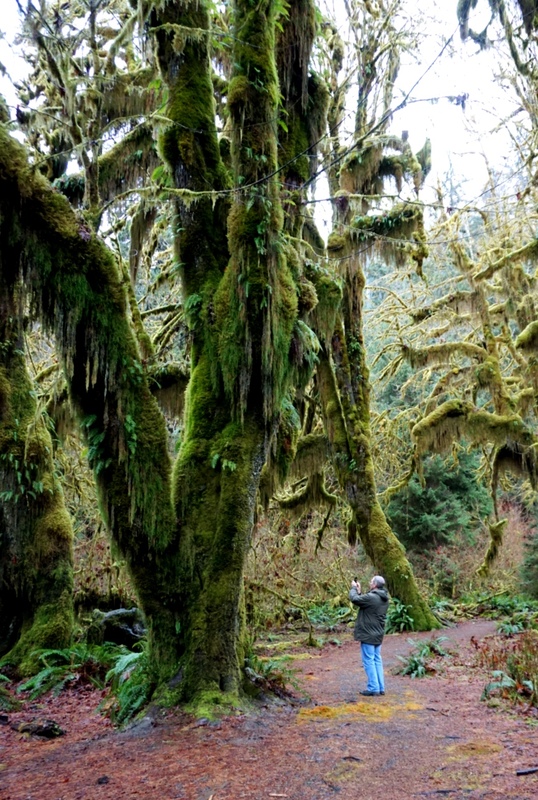 You can see the magnitude of the mosses in this shot of Geoff dwarfed by the mossy trees. And of course, I continued to be on the lookout for mushrooms. I wasn’t disappointed. There were enormous shelf mushrooms that grew tall above my head and tiny mushrooms sprouting from cracks in logs. This tiny fairy village of mushrooms caught my fancy today growing among the mosses. 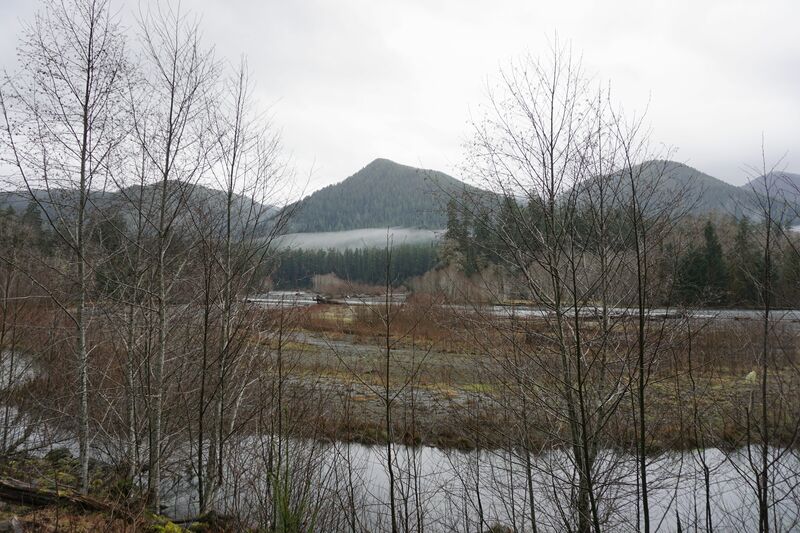 As we left the rainforest my eye was drawn to the way the fog hung low behind the treeline. It almost looks like snow out beyond the river. Leaving the rainforest, we headed north toward Port Angeles and another part of the park. 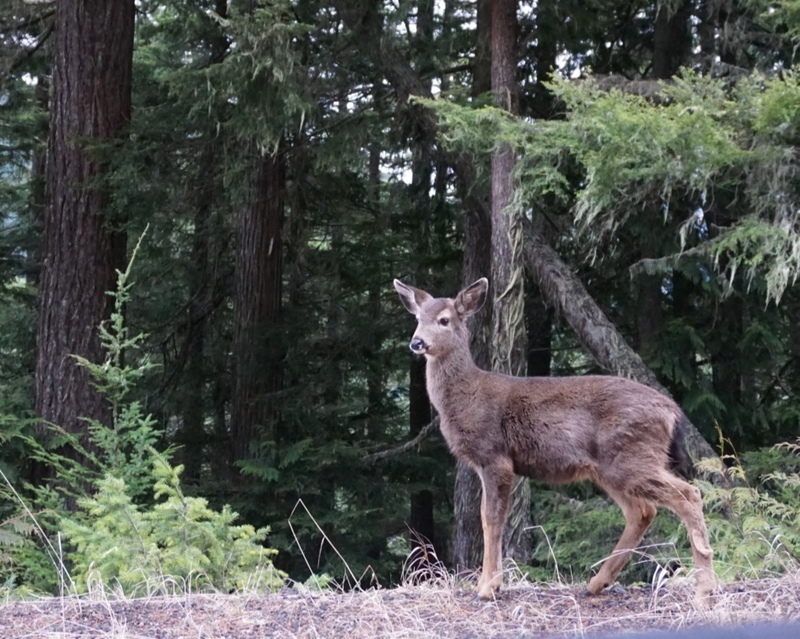 And after an unfortunate encounter with a park ranger (going too fast along the road near the lake) that resulted in a speeding ticket, we headed up to Hurricane Ridge. This is the highest part of the park at over 5,000 feet in elevation. 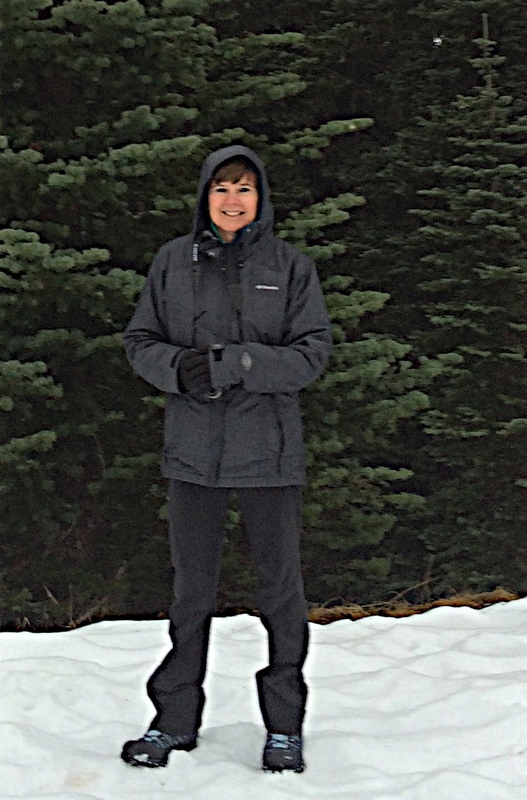 We could see snow capped peaks as we wound our way up and could feel the temperature dropping. And Hurricane Ridge lives up to its name, the winds were vicious as we got out of the car! The fog and snow blended as we looked out across the ridge. We ended our adventure with a delicious and relaxing dinner at Next Door GastroPub…even sharing a rich and decadent dessert. Before heading back to our hotel we took an evening drive around the seaport to try our hand at some nighttime photography. 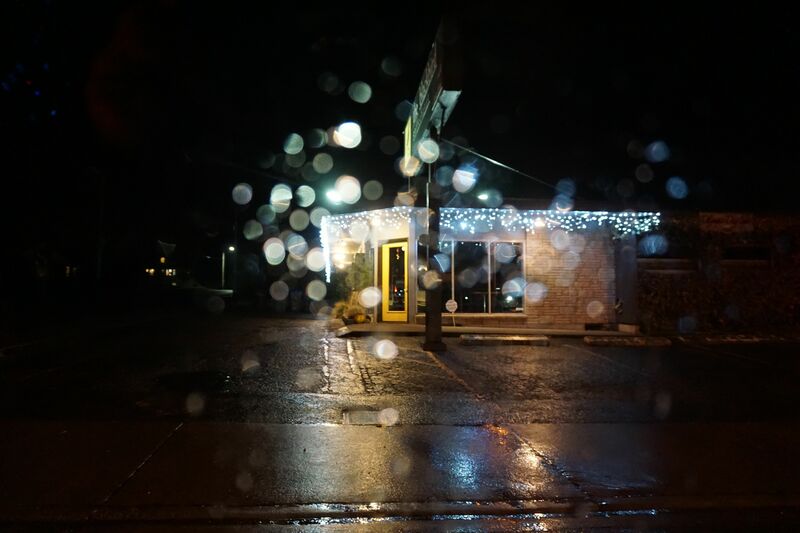 I’ll end with this shot through the rainy car window of a small coffee shop. Another wonderful day exploring, can’t wait to see what tomorrow brings! 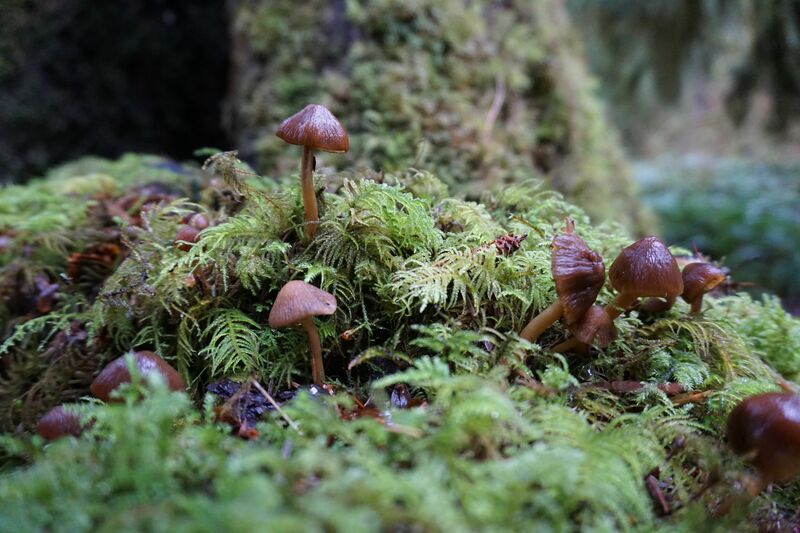 This entry was posted in photography, Slice of Life and tagged hall of mosses, hiking, hoh rainforest, mushrooms, olympic national park, Rain, snow, writing on January 17, 2015 by kd0602.